Partie de la Nouvelle Grande Carte des Indes Orientales.. 4 parts - ELWE, J.B. Title : Partie de la Nouvelle Grande Carte des Indes Orientales.. 4 parts. Size : 19.7 x 23.6 inches. / 50.0 x 60.0 cm. Description :Decorative and complete set of four scarce maps detailing all of Southeast Asia, filled with meticulous topography and place names. 1) Partie de la Nouvelle Grande Carte des Indes Orientales, Contenant les Terres du Mogol? is focused on the Bay of Bengal and details the region from the Pakistani border across India to the Indo-Chinese peninsula with Burma, Cambodia, Vietnam and Laos, showing quite a bit of China and the northern half of Sri Lanka. The Bengal Gulf is adorned with a large compass rose. 2) Partie de la Nouvelle Grande Carte des Indes Orientales, Contenant les Empires de la Chine & du Japon, les Isles Philippines? details the western coast of China, with Korea and Japan as well as the Philippines, Borneo, the Marianas. 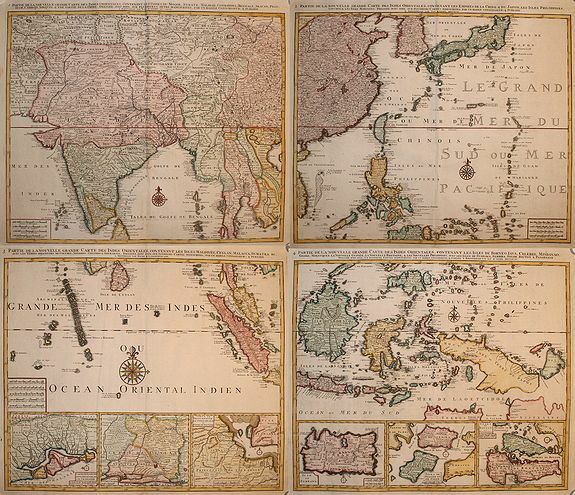 3)Partie de la Nouvelle Grande Carte des Indes Orientales, Contenant Les Isles Maldives, Ceylan, Malacca, Sumatra &c? is centered on a large compass rose. It details the Maldives, Sri Lanka, Sumatra and the Malaysian Peninsula with three inset detail maps along the bottom including a part of the Malabar coastline, a part of the Sri Lankan coast including Negombo, and the Madura Strait between Java and Madura. 4)Partie de la Nouvelle Grande Carte des Indes Orientales, Contenant Les Isles de Borneo, Iava? is focused on the island of Borneo, Celebes, Java, New Guinea, Mindanao and the Philippines. The bottom of the map is inset with three maps-the island of Sumbawa, the islands of Solor and Sebira, and the islands of Bouton and Pangesane. Condition : Good, but they all have small restaurations in the centerfold bottom, mainly in the margin.